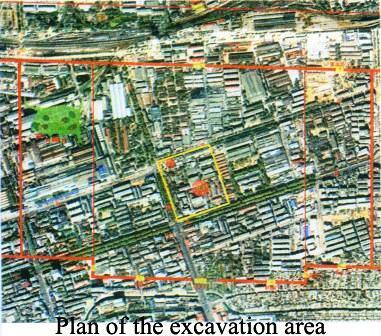 In cooperation with the construction project to preserve and display the central part of the Sui-Tang Dynasties imperial city, archaeologists have conducted a scientific excavation to this area during March 2008 to September 2010. The Imperial Meeting Palace (Ming Tang) and Heavenly Palace (Tian Tang) have been unclosed. Remains from the first period include the earthen base of the central palace, the entrance to the courtyard and the corridor. It is the ruin of the Qianyang Palace in the Sui Dynasty imperial city, measuring 105m from east to west and 47m from south to north, with the south part destroyed. Remains from the second period include the tamped earthen base of the Imperial Meeting Palace (Ming Tang), the corridor and the entrance of the courtyard, dating back to the Tang Dynasty. The Ming Tang, only remaining the tamped earthen base in the shape of an octagon, consists of six circles of octagonal earthen structures with a huge column pit in the center. 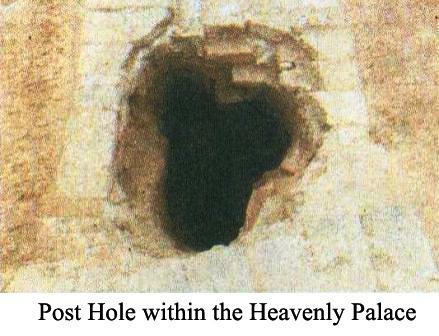 In the pit there is a supporting stone, about 3.67 m in diameter. 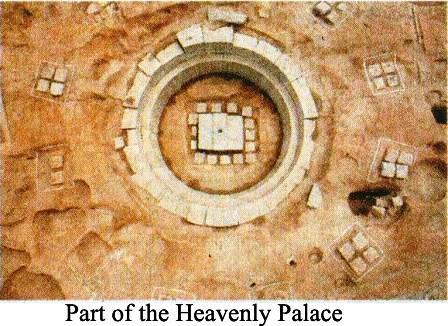 The first circle (innermost) of earthen structure measures 13 m in diameter and 10 m in thickness; the second circle 6 m in width, remaining 1.2 m in thickness; the third circle 8 m in width, remaining 10 m in thickness; the fourth circle 8 m in width, remaining 1.2 m in thickness; the fifth circle 7 m in width, remaining 4 m in thickness; the sixth circle 11 m in width, only remaining two layers of tamped earth. The whole earthen base is about 105 m long from east to west. The tamped earth is pure and hard, with each layer 8-10 cm thick. Remains from the third period include the earthen base of the central palace, the entrance to the courtyard and the corridor, which are ruins of the Taiji Palace from the Northern Song Dynasty. Located 60 m north of the Sui Dynasty palace base, this palace is I-shaped and remains only the foundation. In addition, remains from the early Tang Dynasty and the Later Tang Dynasty to early Northern Song Dynasty have also been found. Unfortunately they are seriously destroyed and the plans remain unclear. This site is located at 155 m northwest of the Imperial Meeting Palace and on the west side of the central axis of the city. There is a square tamped earthen base supporting five layers of round structures. The unique form is considered to be a Buddhist hall to contain Buddha statues. 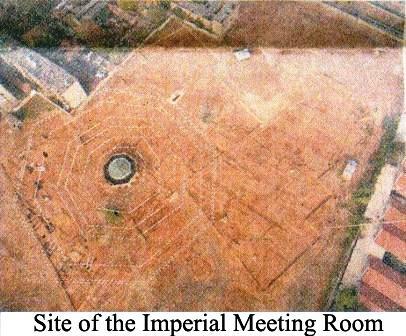 The site could be divided into five periods: except the Heavenly Palace remains dating back to the Impress Wu Zetian period, all other parts, including the corridors, the drain and short separating walls, exist through the four periods as the Sui to early Tang period, middle and late Tang Dynasty, the end of Tang Dynasty to Five Dynasties and the Northern Song Dynasty. 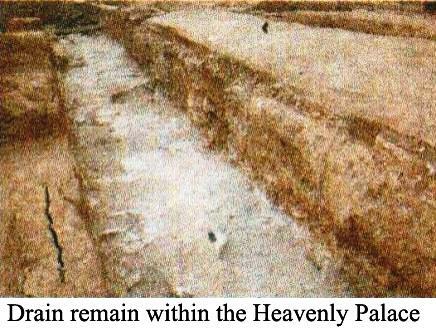 The site of the Heavenly Palace only remains the foundation, with its eastern part connected to the west corridor of the palace and the northern side connected to the north corridor. At the west there are a brick-paved water apron and an east-west corridor measuring 4.33 m wide connecting to other buildings. 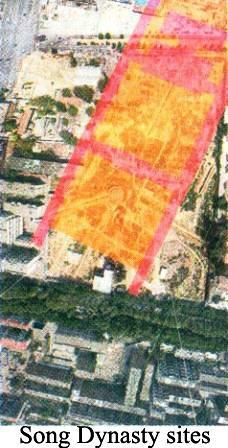 The foundation is slightly in square shape, measuring 77.7 m from north to south and 69.15 m from east to west. At the center there is a stone-built round pit, encircled with two rings of column stones, a ring of tamped earth and a ring of rubbles. 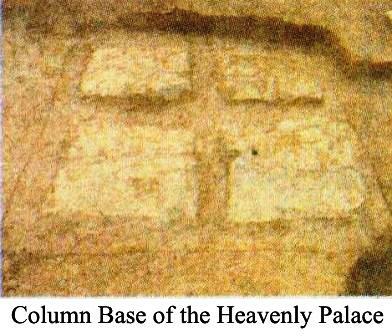 The two rings of column stones have 12 pieces in the inner and 20 in the outer. Each column stone consists of four pieces of stone under layers of earth and stone. The tamped earth is built on raw soil, measuring 5.35 m in width. The ring of rubbles is about 0.5 m wide. The drain is built with bricks and stones. It spread from west to east, encircling the north part of the palace foundation, with 2 m wide and the west section 15 m long and the north section 63 m long.